Saturday marked the second anniversary of GT’s passing, so my early morning perusal of social media was full of my Watford friends paying tribute to our hero. 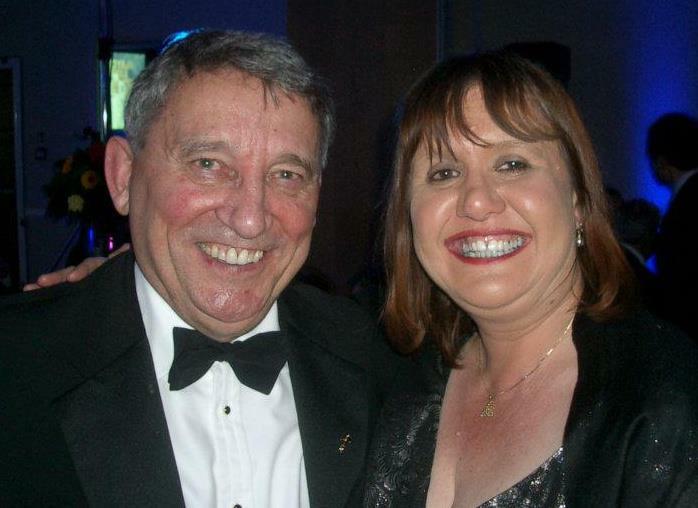 All the happy memories and lovely photos brought both a tear to my eye and a smile to my face. On the train travelling to the game I usually have noise-cancelling headphones on and listen to a podcast, the choice on the way to Selhurst Park being the previous week’s Danny Baker show. On arrival at Twickenham, I was distracted as a familiar looking woman boarded the train and sat in the row in front of me. I took my headphones off in order to hear her speak and, as I had thought, it was Jane Horrocks. I am going to see her in the Pinter plays at the theatre of the same name on Monday, so was curious to hear any backstage gossip. Sadly the conversation seemed to revolve around cold sores and tight boots. The glamour of the actor’s life. I arrived at the designated pre-match meeting place rather early, so I had it all to myself. It was a café rather than a pub and, as my late arrival at the station on the way to game meant that I hadn’t had a coffee yet, I was immediately drawn to the coffee with cinnamon and chili that was on the menu. My first instinct that this may be a little brutal on an empty stomach went out of the window when I asked for a whisky to be added. The lovely woman serving me said that she had already had someone in who had whisky in their hot chocolate, so I didn’t feel like a complete lush. Anyway, when my innocent-looking cafetiere arrived, my choice was vindicated. It was warming and gorgeous. As the others in my party arrived, all started with a tea or coffee, but we soon moved on to a bottle of Georgian red wine (really), which was rather sweet so had to be washed down with some merlot. This was accompanied some rather delicious Polish food (the others went for the beef stew, I had the mixed pierogies). All rather lovely. From the café it was a short walk to Selhurst Park, a ground that I rather like, while being very aware that opinion is shared by a very small minority of away fans. Team news was that Gracia had made one change from the Bournemouth game with Hughes in for Sema. So the starting line-up was Foster; Femenía, Mariappa, Cathcart, Holebas; Hughes, Capoue, Pereyra, Doucouré; Deulofeu and Deeney. Crystal Palace had the unloved ex-Watford loanee, Townsend, in their starting line-up and the much-loved Ray Lew in their dugout. As we were taking our seats, which were at the front of the stand, I was a bit surprised to see that there was a group of young lads standing on the steps at either side of the gangway, blocking the way. This looked like a recipe for trouble, but I assumed that the stewards would notice and clear the access. Watford fans had been encouraged to bring scarves to the game in honour of GT, and these were raised in tribute as the teams came out. 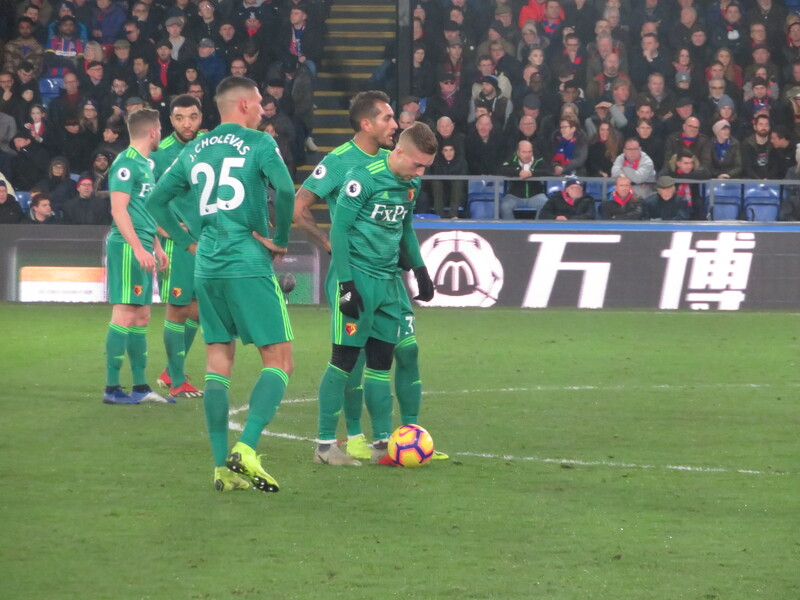 The game started brilliantly for the Hornets who should have taken the lead in the third minute when Deulofeu broke into the box and unleashed a shot which hit the post, Pereyra looked sure to score the rebound, but his shot also hit the post. The first chance for the home side fell to our old friend, Zaha, who cut inside before shooting straight at Foster. At this point, I was distracted by the sight of Javi having a very animated conversation with the fourth official. He appeared really unhappy about something, which seemed to be out of character. This may or may not have been related to the subsequent appearance of two Watford physios on the pitch when there did not appear to be an injury. They were there to take off a very reluctant Hughes. We speculated that he must have a cut that needed attention, but it seems that he had taken a blow to the head and was showing signs of concussion. So, 20 minutes into the game, he was replaced by Sema. Palace then had a couple of chances to take the lead. First Milivojević crossed for Ayew but the header was over the bar. The next to try his luck was Kouyaté with a shot from distance that also missed the target. Watford’s next chance to open the scoring came on 34 minutes as Deeney met a cross from Holebas with a header that flew just over the bar. 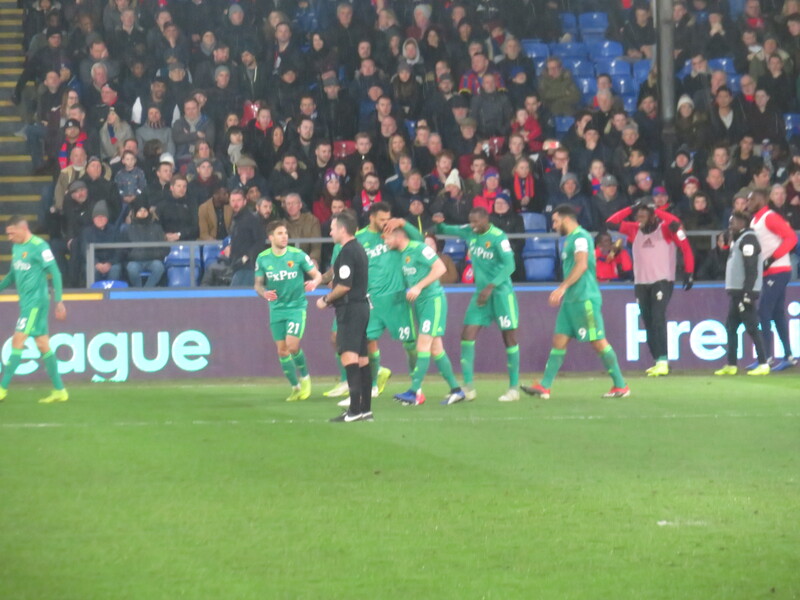 At the other end, Palace had a decent chance from a corner, it appeared that the header from Tomkins had missed the target, but Foster had got a touch to it, so the home side were awarded another corner. From the set piece, there was an almighty scramble which ended with Doucouré blasting the ball off Cathcart into the net. Foster got a hand to the ball to push it away, but it had clearly already crossed the line. Not a good way to concede. The Palace fans started goading us with “It’s just like Wembley.” The only similarity being the poorness of the game. When Palace score there is a call and response with the tannoy announcer naming the goal scorer and then repeating the first name so that the crowd can yell the surname. They did something on this occasion but I must have been mistaken in thinking that they shouted ‘Own’ with the crowd shouting ‘Goal’! Watford tried to break back immediately as Deulofeu went on a run before shooting wide of the near post. In the last minute of the half, Palace were forced to substitute their goalkeeper, replacing Guaita with Hennessey. The home side had a chance to increase their lead before the break as a shot from outside the area by Milivojević took a couple of deflections, but Foster was equal to it. Watford then had a free kick in a dangerous position, but the delivery was dreadful and we went into the break a goal down. So the football had been pretty awful, but the behaviour among the away fans was even worse. We were sitting near the front, just behind the area that I assumed had been designated for those less able to stand. A couple of men, one right at the front, were standing at the start of the game and were politely asked if they would sit so as not to block the view of those who did not wish to/were not able to stand. The reaction of both of them was aggressive and abusive. One eventually moved, but the other, who was mostly seated, still spent the whole game arguing with the elderly couple sitting behind him. It was a very unpleasant distraction and made it difficult to concentrate on the game. At half time, I noticed another row going on in the block next to us and friends who had braved the concourse at half time said that there were arguments going on throughout the stand. Palace had the first chance of the second half as Zaha broke clear, but he couldn’t beat Foster. Watford then had a decent chance as Capoue fired through a crowd, but his shot was deflected for a corner. A cross from Doucouré only needed a touch from Mariappa to draw the Hornets level, but he couldn’t connect. Cool Craig Cathcart doesn’t want congratulations after scoring. We have a game to win. Just before the hour mark there was a flypast of parakeets from behind our stand. As we were wearing our green away kit, I was hoping that this might be a good omen. The first booking of the game went to Femenía who ran into Zaha to stop a break. It was a stupid foul. 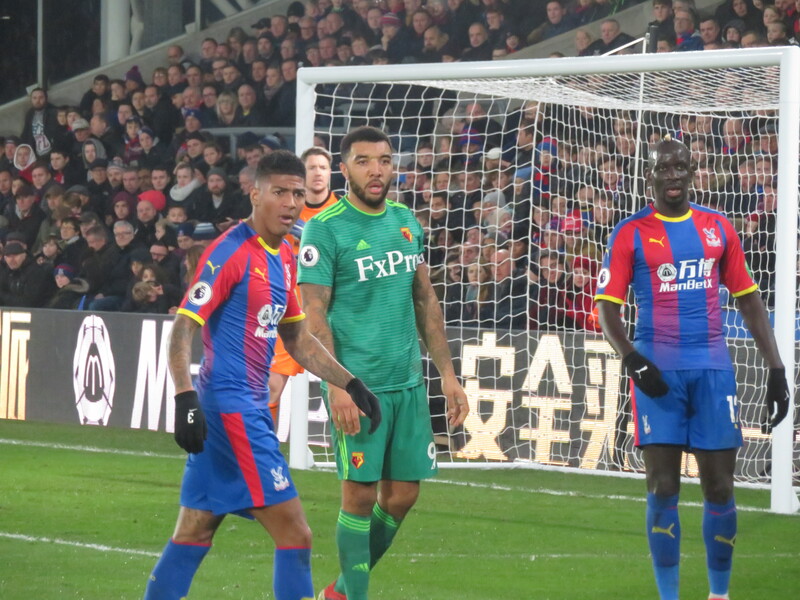 Palace should have increased their lead as Milivojević hit a volley from distance that took a superb save to keep it out, although it looked as though Foster’s good work would be in vain as the ball broke to Ayew who found Zaha with an open goal in front of him, but young Wilf managed to miss, much to the amusement of the travelling Hornets. He must have been mightily relieved that the flag was already up for offside. The second caution for the Hornets came after Townsend robbed Sema and tried to escape but was knocked over for his trouble. On 67 minutes, the Hornets drew level as a deep corner from Holebas found Cathcart rising to head past Hennessey and cancel out his unfortunate own goal earlier on. Needless to say, the lads who had been gathering in the gangway took the opportunity to bundle down to the front. This would surely be an indication to the stewards that some action was needed and a group of stewards gathered and walked up the steps of the gangway, but made no effort to move anyone who was standing blocking the way, which seemed ridiculous. Gracia made a second substitution at this point with Sema (who was a substitute himself) making way for Cleverley. 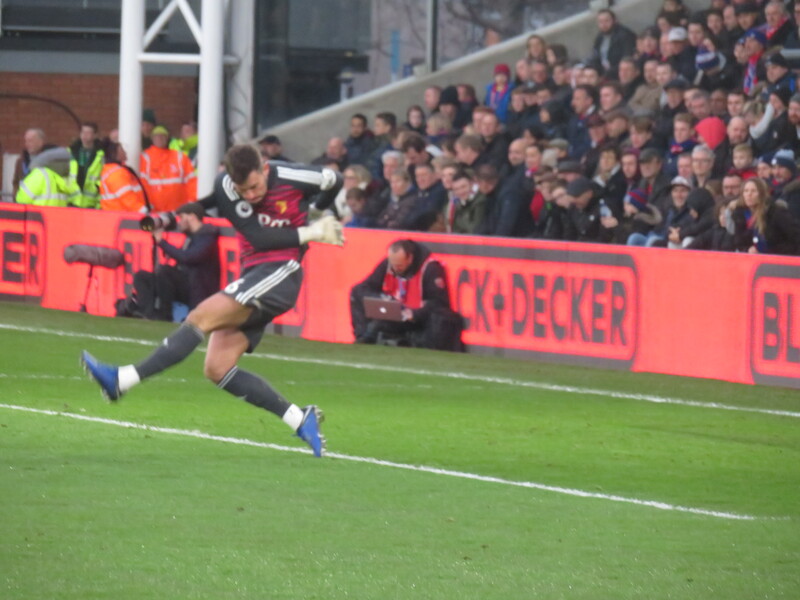 The home side should have regained the lead almost immediately as a low cross from Zaha only needed a touch from McArthur to beat Foster, but the Palace man managed to miss. At the other end, Deulofeu went on a great run before cutting the ball back to Deeney whose shot was cleared off the line. Watford took the lead on 74 minutes when Cleverley hit a half volley into the net. It was a fantastic strike and I couldn’t quite believe that we were in the lead. But the joy of our goal celebration was cut short as the bundle for this one was worse than the first as others got in on the act and people located on the end of rows were being knocked flying. It was dangerous and unpleasant. Palace made two late changes bringing Benteke and Schlupp on for McArthur and Ayew. 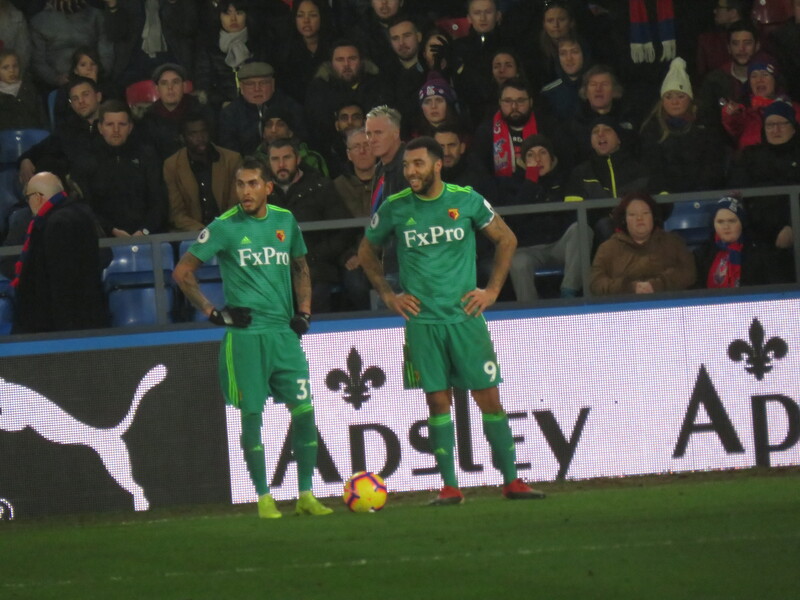 Watford looked to increase their lead as Deulofeu went on a great run that was stopped by Milivojević, conceding a free kick on the edge of the area and earning himself a yellow card. 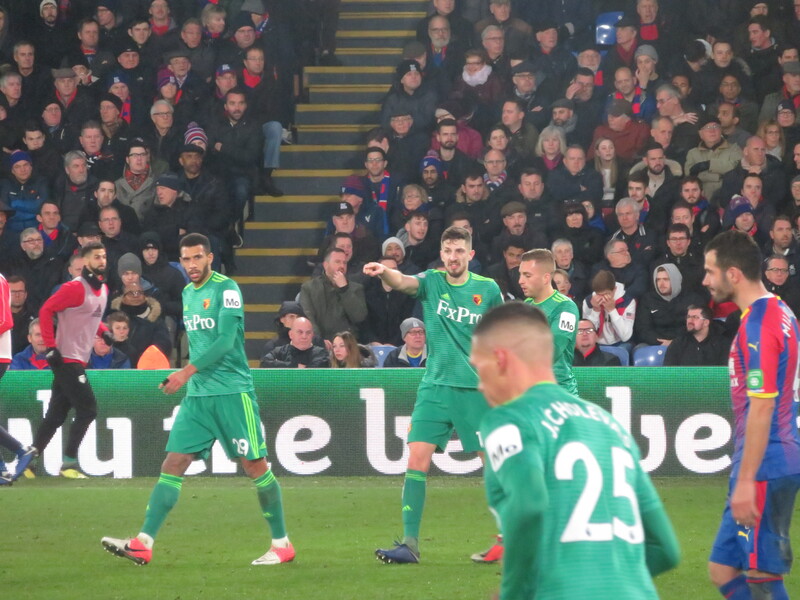 Palace had a great chance to equalise in the last minute of normal time as a cross from Townsend led to a scramble in the Watford box but, on this occasion, the ball ended up in Foster’s arms. Another chance for Palace was thwarted as a dangerous looking break by Zaha was stopped by a gorgeous tackle from Femenía. Gorgeous and brave as he was on a yellow card at the time. Into the four minutes of time added on and Pereyra was booked for time wasting and, soon after, replaced by Masina (to waste some time!) Cleverley was booked for a clumsy foul on Wan-Bassaka and we held our breath as Palace took the free kick and exhaled when it came to nothing. The last action of the game could have seen the Hornets increase their lead as Deulofeu found Doucouré whose shot hit the stanchion. The final whistle went and there were great celebrations in the Watford end, although the over-exuberance among some of the youngsters made this quite unpleasant for a number of the older fans. As the players came over to celebrate with the fans, we greeted them with “One Graham Taylor” as the scarves were held aloft. After the game we headed back to our café where we found that they were almost out of red wine (oops), all that was left was an open bottle. So we had that to fuel our post-match deliberations. It had been a dreadful game of football, but a win over Palace brought a smile to all of our faces. After we went behind it had been a gutsy performance and one that GT would have enjoyed. 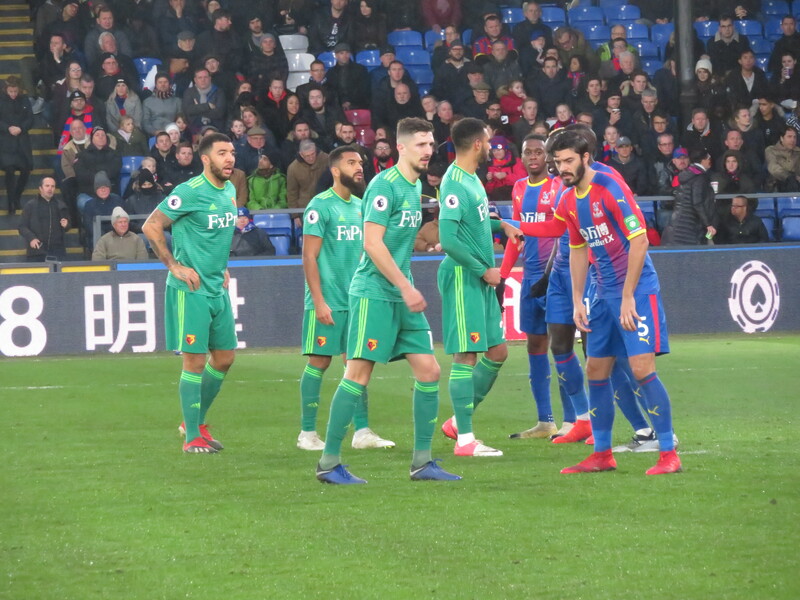 Given how wonderful Craig Cathcart has been this season, it seemed unfair that he had been unwittingly responsible for the Palace goal, so I was delighted that he got the equaliser. I was also thrilled that Cleverley grabbed the winner. He has had a hard time with injuries, so it is great to see him back playing and contributing. I hope that he is soon a regular starter. So we are now seventh in the table with 32 points. Before the game Pete had commented that 32 points might be enough this season and, if you assume that Newcastle will not improve their current points per game tally over the rest of the season, it will be. But, given how disappointing we have been after new year in recent seasons, I really hope that we continue to impress and maybe we can achieve our highest points tally and position since the 80s. This entry was posted in Watford FC and tagged Aaron Wan-Bissaka, Abdoulaye Doucoure, Adam Masina, Adrian Mariappa, Andros Townsend, Ben Foster, Cheikhou Kouyate, Christian Benteke, Craig Cathcart, Crystal Palace FC, Etienne Capoue, Gerard Deulofeu, James McArthur, James Tomkins, Javi Gracia, Jeffrey Schlupp, Jordan Ayew, Jose Holebas, Ken Sema, Kiko Femenia, Luka Milivojevic, Mamadou Sakho, Patrick van Aanholt, Roberto Pereyra, Roy Hodgson, Tom Cleverley, Troy Deeney, Vincente Guaita, Watford FC, Wayne Hennessey, Wilfried Zaha, Will Hughes on January 13, 2019 by franelynn. I wasn’t aware that this had happened at Everton, but at least there was room to move there (we didn’t sit in our allocated seats). There are always issues at Bournemouth and this trouble at Palace seemed to be coordinated. Something needs to be done before someone is hurt. But, if the stewards won’t act, and the Palace stewards steadfastly refused to do anything, I wonder how it can be remedied.